A few nights ago I was introduced to an elderly woman who is writing the history of her parish, Santa Maria Maggiore in Assisi. I feel bad for some of the “other” churches in Assisi. In the shadow of the grand basilicas, they hardly get any love. So the next day I trudged down the hill (they’re all hills here) to Santa Maria Maggiore to check it out. The interior is fairly simple, with a few frescoes and a few statues. 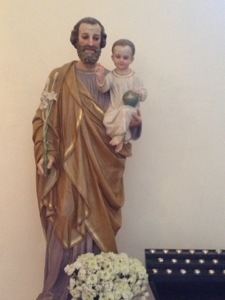 To the right of the altar there is a statue of St Joseph. I wish my photo fully captured the expression of bemused delight on the saint’s face. From now on that’s how I’ll think of Joseph, happy to have a cute kid that knows how to hold a ball (and the earth). 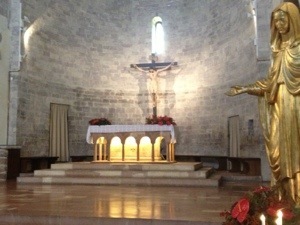 To the left of the altar is a painting of the crucifixion. 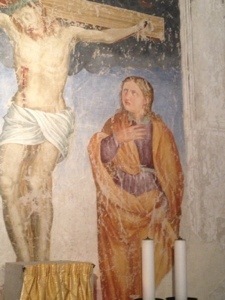 St John is to the right of the cross, and judging by his expression, he is disgusted. 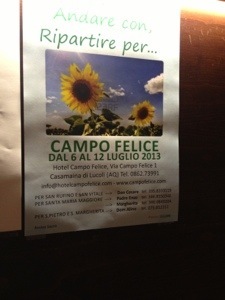 This church was one of many advertising “Campo Felice”. Do you think I’d get a discount? After about ten minutes I’d seen what there was to see. I walked down a side street to my rehearsal, in an old chapel that’s no longer used as a worship space. 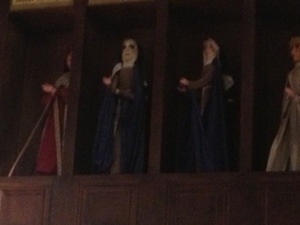 It seems to be where they put on a St Francis puppet show. My favorites are Clare and young Clare. You can tell which is which because the older Clare has false eyelashes. I plan to keep venturing off the beaten path, in hopes there will be more saints who look at me a little differently. I bet not only will the saints look at you differently but you are looking at them differently too as you venture off the beaten path. Very true! There’s nothing like venturing out of the comfort zone to make you see things in a new way.